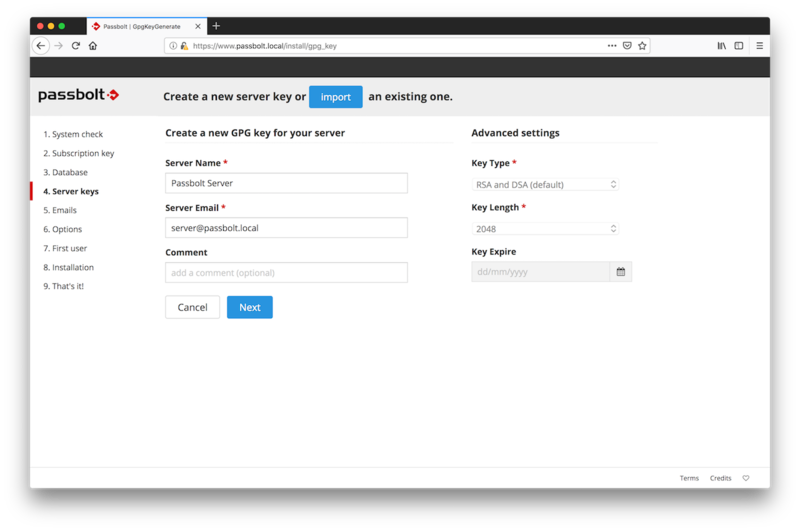 This tutorial describes how to install Passbolt PRO on a minimal CentOS 7 server. The installation procedure is based on install scripts that will do the heavy lifting for you. They will configure your operating system to be passbolt ready and will take care of installing and configuring the web server (Nginx), database (MariaDb), PHP, SSL and GPG keyring. 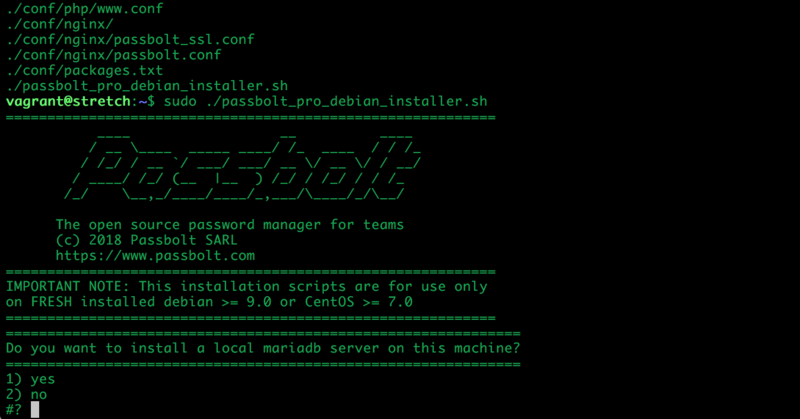 If you prefer to install passbolt manually please refer to this documentation: Install passbolt from source. A minimal CentOS 7 server. A domain / host name pointing to your server, or at least being able to reach your server through a static IP address. Please note: It is important that you use a vanilla server with no other services or tools already installed on it. The install scripts could potentially damage any existing data on your server. Note that you can find the source code of the install scripts on our git repository. The script will take care of installing all the services required by passbolt. It will ask you a few questions in order to adapt the environment to your needs. Do you want to install a local mariadb server on this machine? Yes: if you are not planning on using an external mysql / mariadb server. No: if you have a mysql / mariadb server installed somewhere else and want to use it for passbolt. The script will then ask you for the database details: root password, database name, and password. To configure your webserver, the script needs to know under which hostname or ip it is going to run. Enter here the address (domain, hostname or ip) at which you are planning to access your passbolt after installation. manual: (recommended) choose manual if you have your own ssl certificates. 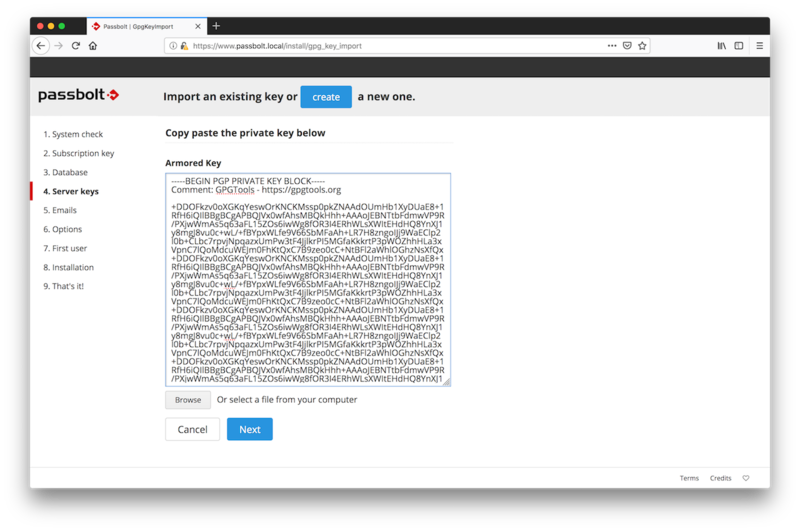 auto: this option will issue a SSL certificate automatically through Let’s Encrypt. Use this option only if you have a domain name that is reachable by the outside world, or it will not work. none: choose this option if you don’t want your webserver to run https. This is not recommended. On virtualized environments GnuPG will most likely not be able to find enough entropy to generate a key. Therefore, Passbolt will not run properly. The script needs to know if you want to help fix this issue by installing Haveged. Haveged is a useful too to fix entropy issues, however it can have security implications. Make sure you understand the risks before answering yes to this question. For each question, depending on your answer, some more precisions can be asked. Just answer the questions and go with the flow. Your environment is now ready to support passbolt. Before you can use the application, you need to configure it. Point your browser to the hostname / ip where passbolt can be reached. You will reach a getting started page. Two options are available: Manual configuration and Wizard configuration. Choose Wizard configuration. This tutorial will guide you through the different steps of the wizard. The manual configuration is not covered in this article. The first page of the wizard will tell you if your environment is ready for passbolt. Solve issues if any and click on “Start configuration” when ready. At this step, the wizard will ask you for your subscription key. You should have received it by email soon after your online purchase. Enter it in the box. This step is about telling passbolt which database to use. Enter the host name, port number, database name, username and password. In this section you can either generate or import a GPG key pair. This key pair will be used by passbolt API to authenticate itself during the login handshake process. Generate a key if you don’t have one. Import a key if you already have one and you want your server to use it. At this stage, the wizard will ask you to enter the details of your SMTP server. 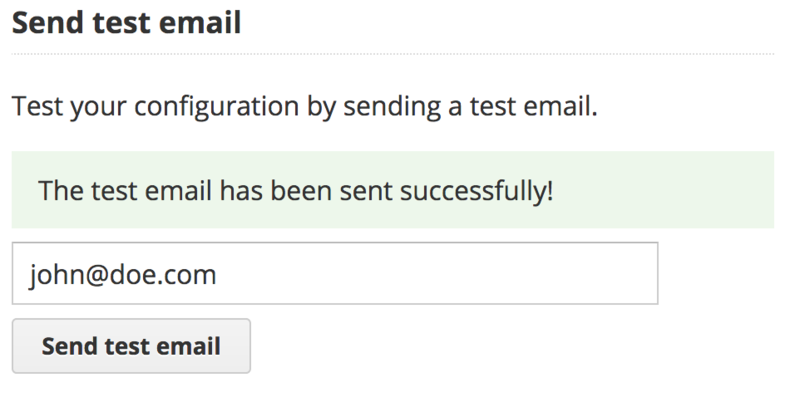 You can also test that your configuration is correct by using the test email feature at the right of your screen. Enter the email address at which you want the wizard to send you a test email and click on “Send test email”. The wizard will then ask you what preferences you prefer for your instance of passbolt. The recommended defaults are already pre-populated but you can also change them if you know what you are doing. You need to create the first admin user account. This first admin user is probably you, so enter your details and click on next. That’s it. 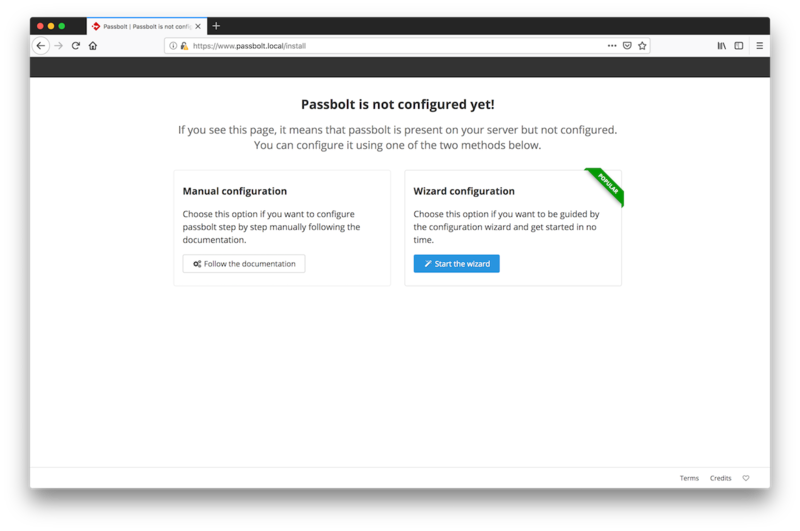 The wizard has now enough information to proceed with the configuration of passbolt. Sit back and relax for a few seconds while the configuration process is going on. Your user account is now created. You will see a redirection page for a few second and then will be redirected to the user setup process so that you can configure your user account. 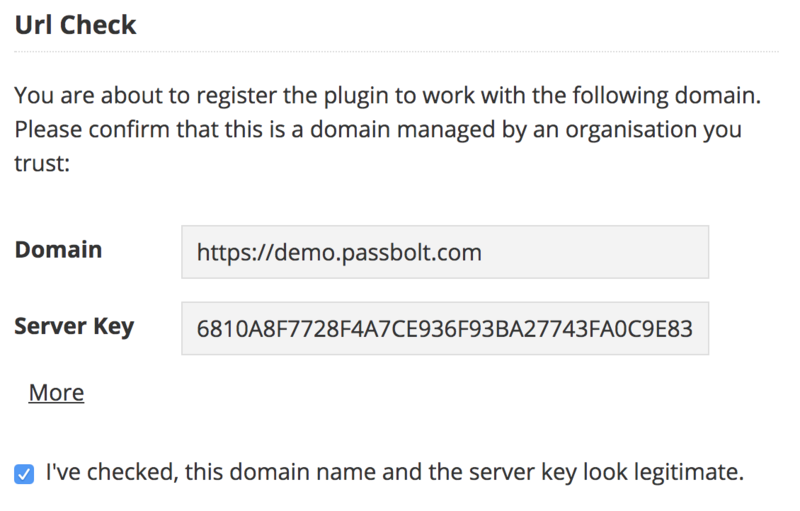 Before continuing passbolt will require you to download its plugin. If you already have it installed you can go to the next step. Passbolt will ask you to check the URL passbolt is associated with. If you recognize the domain name, check the checkbox and then click “Next”. It is a formality here, but it is a security mesure that will help later your users to identify you passbolt instance. 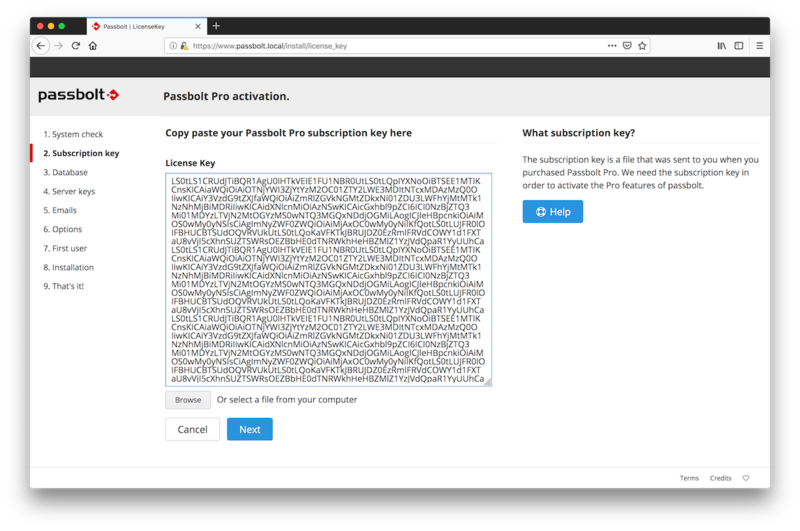 Passbolt will ask you to create or import a key that will be later use to identify you and encrypt your passwords. Your key needs to be protected by a password. 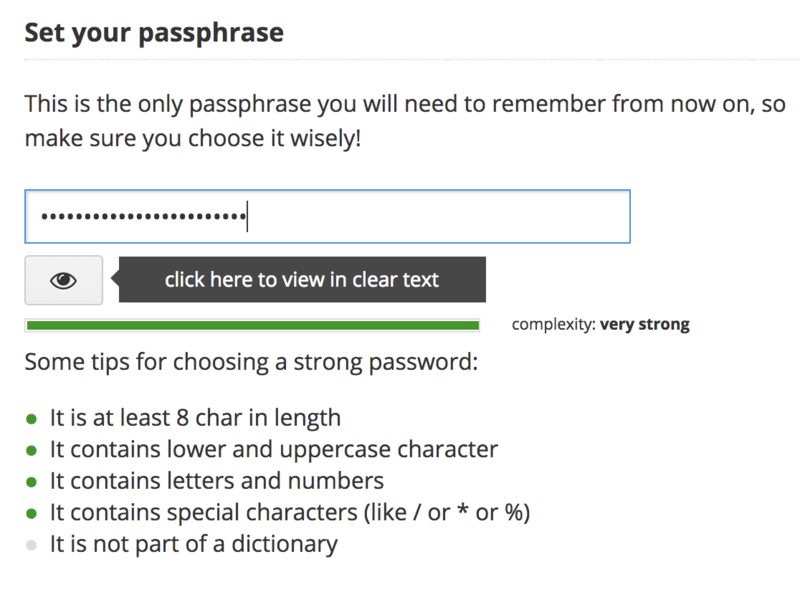 Choose it wisely, it will be the gatekeeper to all your other passwords. This step is essential. Your key is the only way to access your account and passwords. If you lose this key (by breaking or losing your computer and not having a backup for example), your encrypted data will be lost even if you remember your passphrase. Choosing a color and a three character token is a secondary security mechanism that helps you to mitigate phishing attacks. Each time you are performing a sensitive operation on passbolt, you should see this token. Your administrator account is configured. You will be redirected to the login page of passbolt. Enjoy!